Your members and prospective members receive thousands of messages a week. Your member reads emails with one finger on the delete key, trying to scroll through the deluge as quickly as possible. How do you stand out, get read, and inspire your member to action? Not by talking about yourself. 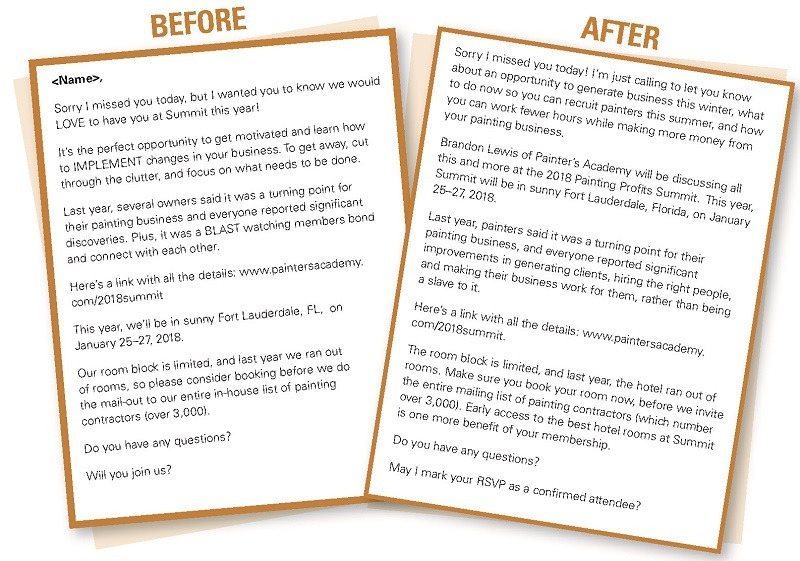 Longtime monthly client Brandon Lewis of Painter’s Academy sent me a copy of an email he wrote to his members. Brandon is a brilliant marketer who helps painters revolutionize their business by generating referrals, maximizing the value of each painting job, and getting repeat business from past clients. Jennifer from his office is planning to place a call to each painter within in his membership program, inviting them to his annual summit. As Jennifer will reach a voicemail, more often than not, it’s important that we provide her with a voicemail message script and a follow-up email. Otherwise, most of the calls will have little impact. Enter the “Before” email above. Notice how the first sentence uses words, “I” and “we” three times? What does everyone want to hear about? Themselves. So, when you start talking about yourself, there’s an instant disconnect. Instead, spin that around. Start with how your message is focused on the reader — in this case, getting new clients during slow season, working less, and making more money. These are all important priorities for painting contractors. I introduce all the problem solving right away in the first paragraph, as well as, when talking about the Summit. Rather than discussing what happened last year in general terms, specifically position the event as the exact antidote to your reader’s greatest problems. As I read my email now, there’s a lot more I’d improve. I drafted it hastily to respond quickly to a client. But take note of the tone, direction of the content, and the emotional connection I’m trying to create with the words. This is what Copywriting for Retention™ is all about. This is one of the toughest lessons to internalize and use. Make every communication about your reader. Focus on your reader’s problems and challenges first. And, make every request, every invitation, and every piece of content about solving your member’s most pressing problem.